French bulldogs "Frustyle", Moscow, Russia. Standart of french bulldog. DATE OF PUBLICATION OF THE ORIGINAL VALID STANDARD: 28.04.1995. BRIEF HISTORICAL SUMMARY: Probably issued, like all the mastiffs, from the Epirus and the Roman Empire molosses, relative of the Bulldog of Great Britain, the Alans (tribe of the Middle Age), the mastiffs and small type mastiffs of France, the bulldog we know is the product of different crossings done by enthusiastic breeders in the popular quarters of Paris in the years 1880. The first breed club was founded in 1880 in Paris. The first registration dates from 1885 and the first standard was established in 1898, year in which the « Sociйtй Centrale Canine » of France recognized the breed of the French Bulldog. The first shown dog was from 1887. The standard, modified in 1931, 1932 and 1948, was reformulated in 1986 by H.F. Reant and R. Triquet (F.C.I. 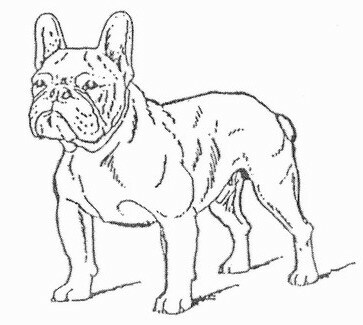 publication 1987), then in 1994 by the committee of the Club of the French Bulldog with the collaboration of R. Triquet. GENERAL APPEARANCE: Typically a small size molossian. Powerful dog for its small size, short, compact in all its proportions, smooth-coated, with a short face, a snub nose, erect ears and a naturally short tail. Must have the appearance of an active animal, intelligent, very muscular, of a compact build with a solid bone structure. BEHAVIOUR / CHARACTER: Sociable, lively, playful, sporty, keen. Particularly affectionate towards his masters and the children. HEAD: The head must be very strong, broad and square, the skin of the head forming almost symmetrical folds and wrinkles. The head of the bulldog is characterized by a contraction of the maxillary-nasal part; the skull has taken up in width that which it has lost in length. TAIL: Short, set low on the rump, close to the buttocks, thick at the base, knotted or kinked naturally and tapering at the tip. Even in action, must stay below the horizontal. A relatively long tail (not reaching beyond the point of the hocks), kinked and tapering is admissible, but not desirable. GAIT / MOVEMENT: Free movement, the legs moving parallel to the median plane of the body. HAIR: Beautiful smooth coat, close, glossy and soft. All the fawn shades are admitted, from the red to light brown (cafй au lait) colour. The entirely white dogs are classified in « brindled fawn with predominant white patching ». When a dog has a very dark nose, dark eyes with dark eyelids, certain depigmentations of the face may exceptionally be tolerated in very beautiful subjects. SIZE AND WEIGHT: The weight must not be below 8 kg nor over 14 kg for a bulldog in good condition, size being in proportion with the weight.